They feed on most pasture plants, pasture weeds and brassica seedlings but favour legumes including clovers and lucerne. 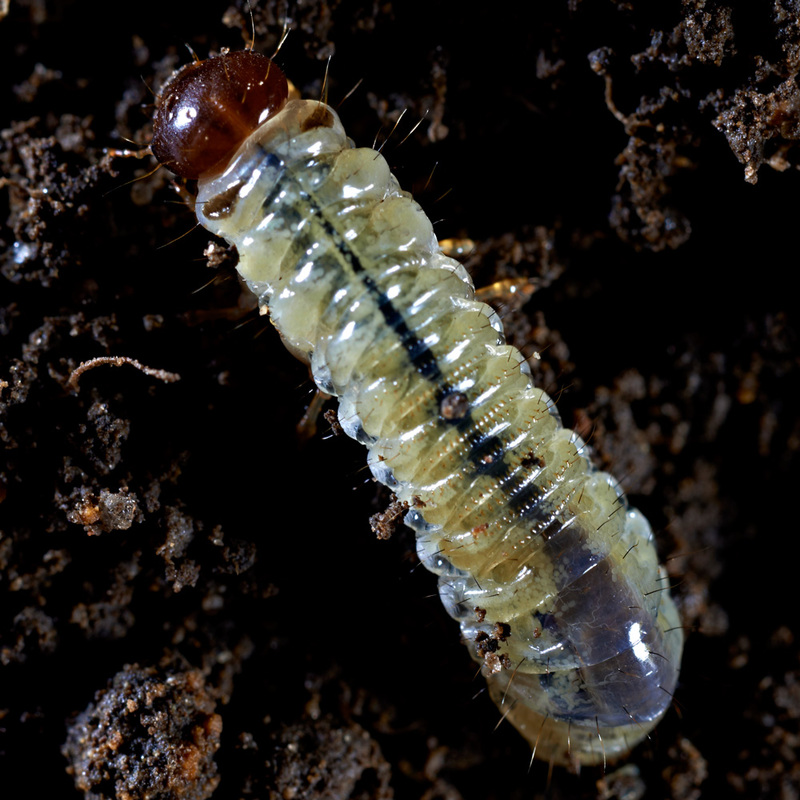 Tasmanian grass grub originates from Australia and was first found in New Zealand in 1916. It is found in the northern North Island north of Lake Taupo, Hawkes Bay, coastal Taranaki, Marlborough and the Canterbury plains as far south as Timaru preferring areas with light soils and dry summers. Adult beetles are up to 12 mm long, dark brown to black, with well defined lines on their wing covers. They commonly fly from January to March on warm calm nights 2-3 days after rain and are strongly attracted to lights. The flights may be female beetles seeking sites to lay eggs or feeding flights. Beetles feed on dung, favouring fresh horse or cattle dung which they can feed inside of, although sheep and poultry dung may also be utilised. 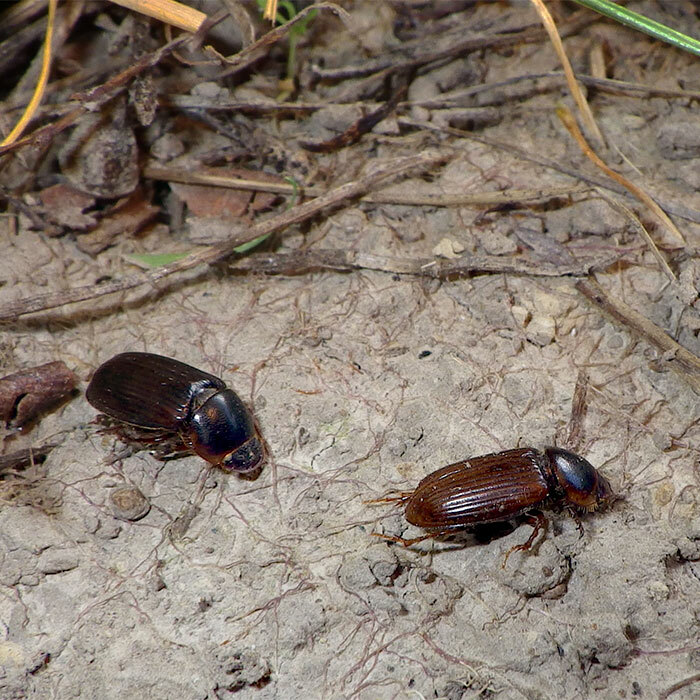 Beetles mate soon after emerging from the soil in which they lived as grubs. The females seek out moist, usually bare, soil in which to lay their eggs in batches of up to 35 no more than 10 cm deep. A second, usually smaller, batch of eggs may be laid after a few days of feeding. Ideal flying conditions lead to wide dispersal of the females and consequently eggs. Less favourable conditions result in egg laying being taking place close to where the females emerged or fed. Eggs are laid from January to April. The time taken to hatch varies from 14 days at 20-24oC to 45 days at 14-16oC. After hatching the larvae move to the soil surface where they begin feeding and form burrows. Young larvae feed primarily on dead plant material and dung but will take some fresh plant material. The larvae develop through 3 stages (instars) increasing the depth of their burrows as they grow reaching depths of up to 25 cm. The 2nd and 3rd instar larvae feed on live plant material. The 3rd instar is the stage that causes most pasture damage. The larvae are surface foragers but take foliage back to their burrows to feed and may store enough several days. They feed on most pasture plants, pasture weeds and brassica seedlings but prefer legumes including clovers and lucerne. The larvae move about freely on the soil surface seeking food or dispersing to new feeding areas and constructing new burrows when they find suitable sites. Light rain and mild temperatures favour larval activity but heavy rain may cause high mortality. Moisture is essential for development, egg hatch and enabling larvae to feed. Conversely dry weather delays egg hatch, discourages larval feeding, increases development time and may cause starvation. Superficially the larvae resemble grass grub but the head is dark brown/black compared to a light tan for grass grub. Their burrows, and soil excavated from them, are similar to porina burrows but differ in that with Tassmanian grass grub the soil forms loose piles not held together with silk. Tasmanian grass grub prefers light soils and favours legumes as food plants but will feed on grasses particularly if they are fine leaved. Larvae are primarily grazers and where numbers are high feeding can result in plant deaths through severe grazing of plant crowns. In hill country where this happens the bared soils become susceptible to erosion. Extensive burrowing activity can bury closely grazed plants and the fine castings are easily windblown. Damage is most evident in winter and spring when larvae are large. In established pastures production can be reduced by up to 8% per 100 larvae/m2 and populations can reach over 1500/m2. When populations exceed 800/m2 the legume component of pastures can be substantially reduced. Young seedlings are particularly vulnerable to larval feeding, especially when pastures or crops are established by direct drilling. The bare ground associated with herbicide induced fallow offers an abundance of egg laying sites. Similarly beetles are often attracted to brassica crops grown for summer grazing due to bare open ground and copious fresh dung. Upright grass varieties with large tiller diameters (>1.5 mm) especially if they are drought tolerant are unfavourable for Tasmanian grass grub. Maintaining good pasture cover during January/February reduces the availability of egg laying sites. As beetles prefer fresh dung dispersing it by harrowing may make it less accessible. As for most pests, well managed and fertilised, strong healthy plants will tolerate more damage than plants under stress. Cultivation of infested pasture in late spring/early summer may result in high mortality of pupae and larvae allowing establishment of new pasture. Later cultivation may create enough disturbance for larvae to die of starvation but this should be checked before sowing takes place. 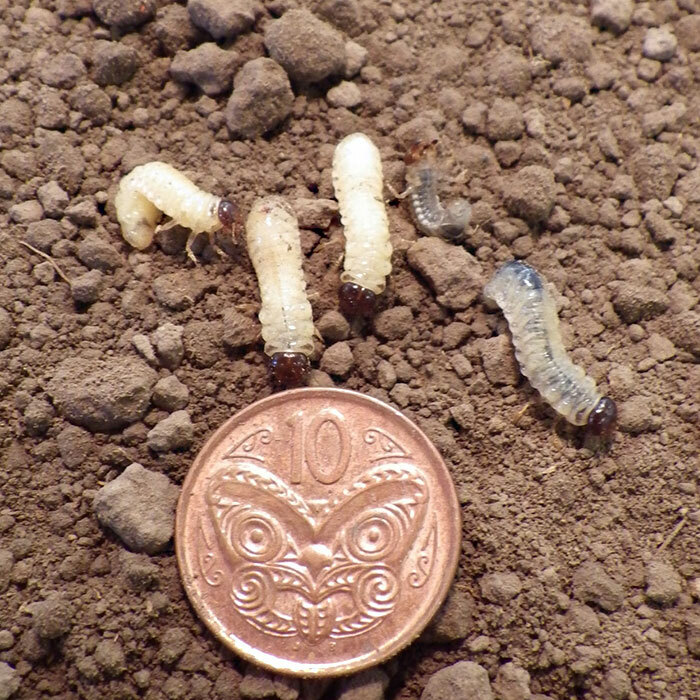 Direct drilled paddocks should be closely monitored for the presence of larvae before sowing. When larvae are present at damaging levels insecticide may be the only recourse to limit damage and save pasture. Chemicals registered for Tasmanian grass grub control are shown below. Slay MWA and Brock JL. 2002. Tasmanian grass grub. A guide to identification management and control in Hawkes Bay. Hawkes Bay Regional Council. Cliff Press Printers Ltd.56p. Enquiries about Tasmanian grass grass grub can be directed to Richard Townsend, AgResearch Ltd, Lincoln.